Hidden Pond Kennels is proud to introduce our new K9 Search and Rescue Academy with Labrador puppies specifically bred for search and rescue purposes. Since the idea for this undertaking manifested, we have worked diligently to ensure we have the best possible breeding stock. The Labrador puppies we breed for search and rescue come from long lineages of dogs bred for this purpose, as well as for superior hunting ability. While every Labrador bred by Hidden Ponds comes from an outstanding pedigree, all Labrador puppies bred for search and rescue are adequately evaluated for their natural drive, nosework ability, and natural agility prior to being chosen for the Academy. Because these characteristics are highly prevalent in this breed, Labradors are often in high demand as search and rescue dogs. Once trained, our Labradors will be used by law enforcement, fire departments, and other first responders, as well as those individuals and groups who volunteer to use search and rescue dogs when people are in need. Hidden Pond Labradors is pleased to partner with John Bellocchio, who will be running the K9 Search and Rescue Academy. John is a highly-trained and credentialed search and rescue trainer, having reached the highest levels (SAR Tech III, FEMA Integrated Management Systems Certifications, etc.) of certification. As you consider purchasing a Labrador search and rescue dog form Hidden Pond Kennel and signing up for the Academy, understand that search and rescue training focuses heavily on the commitment of the handler. We will give you the basics, but working with your future team, being a committed lifelong student to the changing needs of search and rescue and focusing on new local and state mandates will preserve your viability in the field. 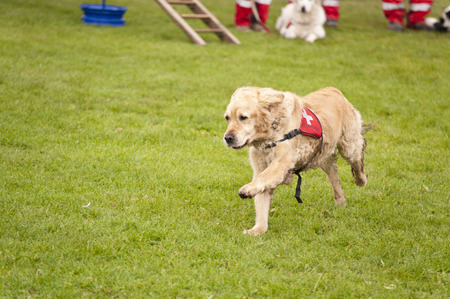 Agility: Search and rescue dogs do not have to have the same abilities as a competing agility dog, but both the Labrador and the owner need to learn the confidence to go through thick brush, over logs, and through mud and moving water. A confident owner leads (literally) to a confident K9 – this will be a major focus of the learning we do. Using and reading a compass: We will explore the basics of compass usage – true north vs. magnetic north, etc. Some teams use advanced GPS technology, but not all. Using a compass is key. Basic readiness for you and your dog: What should be with you when you train? Remember, a search and rescue emergency can happen in any and all weather. Labrador Retrievers, in particular, do better in cooler, damp, rainy, or snowy weather and require additional support in extreme heat. A call out for a team can happen anytime, anywhere. K9 first aid and CPR and AED usage: To make you more valuable to a search and rescue team, you will be given the opportunity to be certified in CPR/AED usage and patient/victim carryout from a heavily wooded area. Remember, search and rescue personnel are there to support lead agencies, which depending on the state, will be either the local sheriff, or in Northeastern States and New England, the State Police. In some states, especially in New England, the State Department of Fish, Game, and Wildlife will be the primary agency of responsibility. You will be prepared to take the appropriate online, free FEMA courses, so you understand the concept of incident command systems, which since 9/11/01, have been nationally standardized. With the growing opioid crisis in the United States, and the noted epidemic of youth and young adult loneliness by the CDC, more and more individuals are getting lost, either accidentally or on purpose. No area of the United States is exempt from this form of loss, as cases like this pop up in both rural and urban areas. Additionally, with the rise in Alzheimer’s Disease and dementia among an aging population, more and more individuals who are particularly vulnerable to the weather are venture too far from home and become lost. In situations like this, time is of the essence. 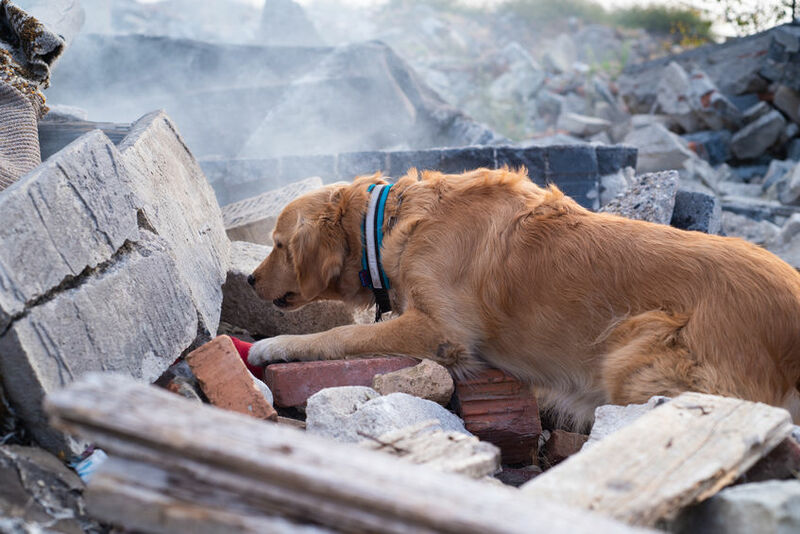 In search and rescue situations, dogs prove to be vital in locating and recovering victims. Labrador Retrievers, in particular, not only have the superior scenting ability to lead rescue teams in the right direction, but the capacity to concentrate on their scent work in even the most highly-populated areas. The Labrador Retriever’s level of intelligence, agility, and eagerness to please their handler are also evidential in what ranks them among the primary breeds selected for search and rescue work. Labrador search and rescue puppies for sale through Hidden Pond Labradors also include a week long training class with John. You and the dog will train together in the classroom and in the field. Before applying to purchase a Labrador search and rescue dog, please note that in every state, individual handlers must become (at the very least) SAR TECH III certified through the National Association of Search and Rescue for insurance purposes. Search and Rescue Training, like all training of dogs, requires a full commitment by the owner/handler after the class ends. 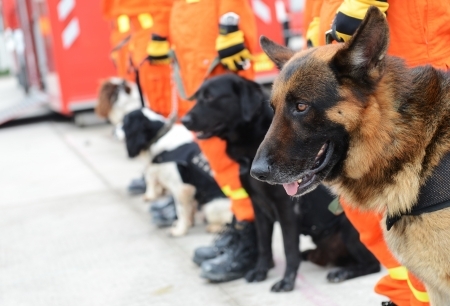 Our class will give you the necessary nosework and agility tools to join a search and rescue team as a probationary member, and work with the team and local and state authorities to ensure you are ready for the SAR TECH exam. For more information regarding the K9 Search and Rescue Academy or any of our Labrador search and rescue dogs for sale, contact Hidden Pond Labradors via phone at 607-857-1461 or email at John@HiddenPondLabradors.com today.